Alexander Gray Associates presented an exhibition of video works by Ann Carlson and Mary Ellen Strom. Ann Carlson's award-winning, performance-based works are renowned for expanding the boundaries of dance and choreography. Collaborative in content and process, Mary Ellen Strom's video works blur the line between activism and art history, media and representation. Through their collaborative work since the early 1990s, Carlson and Strom have married social, political, historical and formal concerns. These collaborations are notable for their community engagement, experimental form, technological experimentation, and activist sensibilities. On exhibit was Sloss, Kerr, Rosenberg & Moore (2007), a video made in collaboration with four practicing New York City attorneys John Sloss, Chet Kerr, Scott Rosenberg and Thomas Moore. The work features the lawyers performing a movement and vocal score that references their work and lives. The rhythmic sequences illustrate the performative aspects of litigating, the pressures experienced while working inside the juridical system, the contest, the service and ultimately the lawyers individual humanity. Highly formal in its spatial design and patterning, the work becomes a kind of twenty-first century folk dance. Also on exhibit was Four Parallel Lines (2007), a video installation made in collaboration with four men who work as day laborers, Jose Bautista, Joel Gomez, Lisandrow Vicente and Carlos Hernandez. 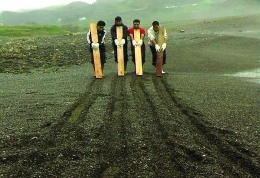 Four parallel lines are drawn on a stretch of beach using 6 x 2 inch lumber. This scene references Walter De Marias’s, 1968 earthwork in which he drew two parallel mile long lines in the Mojave Desert. During the scene the ocean eventually washes the workers line drawings away, with the water resembling a white paint spill. Art historical references are deployed to frame and give focus to the lives of immigrants and their labor. The video strives to engage the spectator both viscerally and critically by presenting an immersive, physical experience through landscape.